What is System Change for Successful Children? 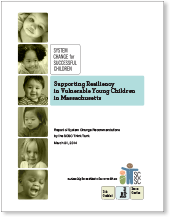 From 2011 to 2014, the System Change for Successful Children (SCSC) project brought training and early childhood mental health consultation to professionals working with families and young children served by the Franklin/Hampshire Area Office of the Massachusetts Department of Children and Families (DCF). How has CES supported this work? The Collaborative for Educational Services Early Childhood Department, in partnership with several local and state organizations and agencies, supported the SCSC project by providing training and consultation focused on meeting the social and emotional needs of very young children, with priority for infants and toddlers, whose families are in the midst of stressful situations. Using a train-the-trainer model, professionals learnt to minimize trauma and support children of families receiving DCF services, and impart these practices to colleagues in child welfare and early childhood programs. Mental health consultants also worked with DCF staff on a weekly basis, and provided on-site consultations at early childhood programs and to parents, to deepen understanding about child development and how to address the individual needs of young children. The SCSC project also worked to improved collaboration between the early childhood and child welfare systems. Massachusetts Department of Early Education and Care. The SCSC project is funded by a federal grant from the Children's Bureau of the Administration for Children and Families.